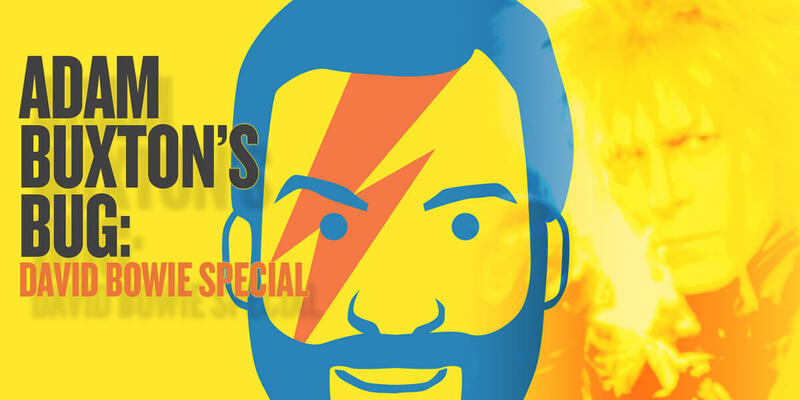 Following Adam Buxton’s awe-inspiring show at this year’s Vodafone Comedy festival, Buxton has announced his return to Dublin this November to present his very special BUG show celebrating some of David Bowie’s incredible music video and other on-screen appearances. This BUG Special is a wonderful opportunity to enjoy some key moments from David Bowie’s life and career on the big screen – and remember the indelible mark he made on our cultural landscape. BUG began in April 2007 as a series of bi-monthly shows at BFI Southbank – the home of British cinema. These celebrations of global creativity in music video have since become a phenomenon, as popular and brilliant as the visual ideas which the BUG team unearths. Host Adam Buxton is a British comedian, actor and director who has appeared in films such as ‘Hot Fuzz’, ‘Stardust’ and ‘Son Of Rambow’ as well as a variety of TV shows in the UK. He has hosted BUG since its inception in 2007, including fronting the TV series on Sky Atlantic in 2012. Along with lifelong friend Joe Cornish he also is one half of award winning TV, radio and podcast duo Adam & Joe who have worked together since 1995.